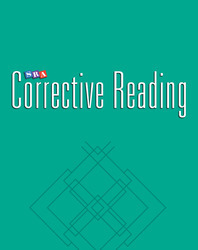 Corrective Reading provides intensive intervention for students in Grades 4-12 who are reading one or more years below grade level. This program delivers tightly sequenced, carefully planned lessons that give struggling students the structure and practice necessary to become skilled, fluent readers and better learners. Four levels for decoding plus four for comprehension address the varied reading deficits and skill levels found among older students. Includes a point system based on realistic goals to motivate students who are often expected to fail.